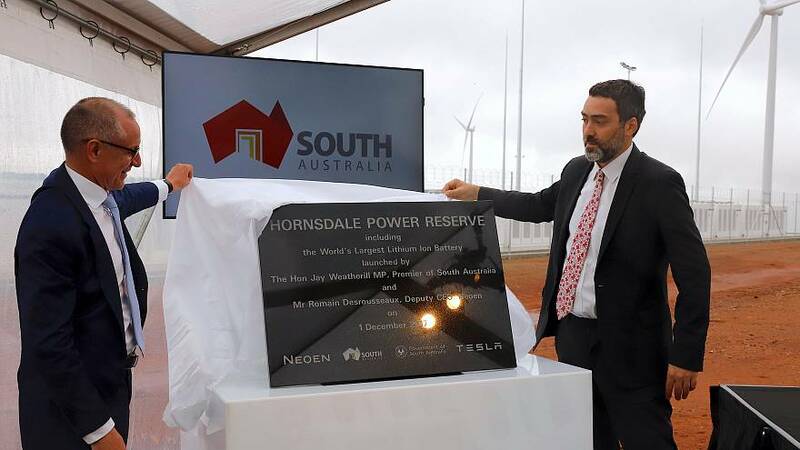 Tesla Inc switched on the world's biggest lithium ion battery in time to feed South Australia's shaky power grid for the first day of summer. The move fufills a promise by the firm's founder Elon Musk to build it in 100 days or give it away for free. Tesla won a bid in July to build the 129-megawatt hour battery for the state of South Australia, which has expanded in wind power far quicker than the rest of the country and suffered a string of blackouts over the past 18 months. Supporters of the project say it will help stabilise the grid and provide "dispatchable renewable energy" in a region that now gets more than 40 percent of its electricity from wind energy. But critics have described it as a "Hollywood solution" in a country that still relies on fossil fuels, mainly coal, for two-thirds of its electricity.